Without question, my favorite author is David Sedaris. Since blowing off studying for tests in college to read Me Talk Pretty One Day, I have waited with eager anticipation for him to write his next book. Everytime one is released, I read it immediately. He's probably the only author whose book I could conceivably finish in one day and definitely the only author whose entire collection I've already read (sometimes more than once). He is hilarious, ridiculous, and clever, and everything that I'd like to be as a writer (that's a hint for you to tell me how hilarious and clever I am at the end of this post). Holidays on Ice is a collection of holiday-themed stories he wrote. One of the stories, "Santaland Diaries," was adapted for the stage and was being performed by a local theatre company in my neighborhood. So my friend Maribeth and I sent the last of the holi-days out in humorous fashion, and we watched one of my favorite authors come to life in a play as Day 98's thing I've never done before. 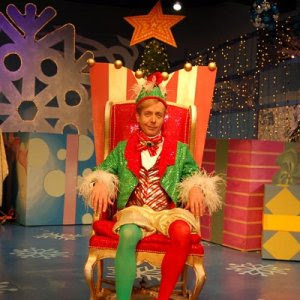 "Santaland Diaries" is Sedaris' real-life account of his job as a Christmas elf at Macy's in New York City. I want to recap it for you, but there is absolutely no way I could ever do it justice. Just consider a grown man, desperate for a job in an expensive big city, who signs on to be an elf, forcing him to interact with harried Christmas shoppers, whiny children and a diverse, eclectic bunch of fellow elves. If you have a sense of humor at all, you'll agree that's funny. But Sedaris is much more than funny, and this true story about his holiday employment is ridiculous. The way he brings these characters to life, you feel like you know all of them. You may be one of them. There was audience participation in the play, which always makes me uncomfortable, partly squirming in my chair praying that they won't call on me to participate, and partly pitying the fool that does get called on. Thankfully, a guy named Jamie was called on in our group and he was an excellent sport. The cast at Horizon Theatre in Little Five Points did a great job at bringing a story that I love to life on the stage. The end of the show was a reminder that it was time to go back to work and get back to reality, which was sad. But the laughs were a reminder that a whole bunch of laughs await me in 2010, probably at the hands of David Sedaris and hopefully because of my own adventures, too. If you haven't read this book or seen this play, DO IT NOW. You are definitely hilarious and clever. I'm not just saying that because I'm your MOM either! Sedaris' book When you are engulfed in flames is one of my all time faves! You are hilarious & clever & an inspiration! I read your blog before I update mine, (ontheroadcoles.blogspot.com) to help me be 'in my right mind'. I like how you capture my attention & cover every detail. i'm so glad i listened to rutledge wood when he tweeted about your blog! Day 117: Who's Bad? Not These Guys!